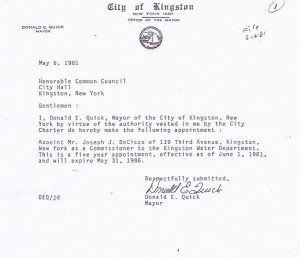 Today, we acquired the appointment and terms of the current City of Kingston Water Board Commissioners Appointments and Terms. We haven’t located anything yet that speaks to term limits for the Water Board, and invite citizens to do a little research by going through the Code to find any information alluding to terms (and how many can be served consecutively or otherwise) for Boards and Commissions. We understand that as it has been in the past, the City of Kingston struggles with capacity to fill these volunteer seats. However, given the current proposed Water sale, we suspect that probably today the Mayor wouldn’t have any trouble finding new qualified members. Click on the image below to view the PDF document of each current members terms. The Chair, for example, has been on the Water Board since 1981. It is not clear if they have been consecutive terms. Click on image to see all of the documents pertaining to the Kingston Water Board Appointments and Terms. KingstonCitizens.org Announces New Citizen Committees to Focus on Proposed Niagara Bottling Water Sale in Kingston, NY.